TAILGATE Party starts at 5PM. 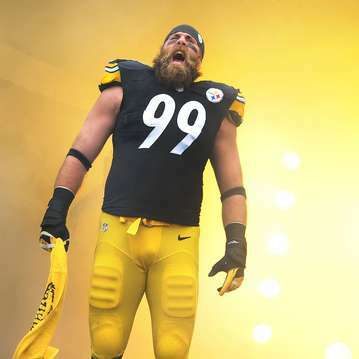 Games, Prizes, Raffles and a chance to hang with Brett Keisel before the signing!! $55.00 entry fee which includes, 1 autograph, the TAILGATE party and also Includes JSA Cert and 1 FREE raffle ticket. NO CHARGE FOR PHOTO OPS!!! INCLUDED!! IF YOU WOULD LIKE TO BRING A GUEST, EACH TICKET HOLDER MAY BRING 1 GUEST AT NO ADDITION CHARGE. (EXTRA GUEST DOES NOT RECEIVE AN AUTOGRAPH BUT MAY ATTEND TAILGATE) EACH ADDITIONAL NON AUTOGRAPH TICKET GUEST MUST PURCHASE A TAILAGATE ENTRY TICKET. THIS IS AN EVENT TO MEET AND GET AN AUTOGRAPH WITH MR. KEISEL. COME HUNGRY, HOTDOGS AND CHIPS AND SODA PROVIDED AND INCLUDED IN THE PRICE. We will have Jerseys, Photos, Helmets and Minis helmets available for purchase, or you can bring your own item.